Directions (1–5): Study the following information carefully to answer the given questions. There are five married couples in a family and each of the couple has one child who is wearing a Jersey of a different number viz. 3, 5, 6, 4 and 9. The name of the five children are G, H, I, J and K. L, A, E, C and N are the fathers. P, D, M, O and B are their mothers but not necessarily in the same order. Either E or N is the husband of D. Neither I nor G is the child of L. L’s child is not wearing 3 and 9 number jersey. M’s child is wearing jersey number 6 and her husband is one among A, E and N. E is the husband of P. H is wearing 3 number jersey. K is not the child of P. B’s child is wearing five number jersey. Neither J nor G is a child of B. K’s jersey number is multiple of 3 but he is not a child of L. H is not the child of E.
Q1. What are the names of N’s wife and his child? Q2. Who among the following is the wife of L? Q3. What is the name and the jersey number of C’s child? Q4. Who among the following groups of persons are the parents of G? Q5. What is the jersey number of J? (i) ‘X @ Y’ means ‘X is not smaller than Y’. (ii) ‘X $ Y’ means ‘X is not greater than Y’. (iii) ‘X % Y’ means ‘X is neither smaller than nor equal to Y’. (iv) ‘X # Y’ means ‘X is neither greater than nor equal to Y’. (v)‘X © Y’ means ‘X is neither smaller than nor greater than Y’. (a) If only I is true. (b) If only II is true. (d) If neither I nor II is true. 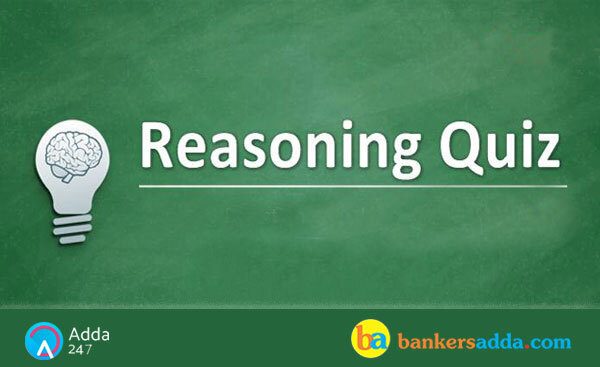 Q11 How many meaningful words of four letters can be formed using first two and the last two letters of the word ‘LONGEST using each letter only once’? Q12. How many such pairs of letters are there in the word ‘CLEANEST’, each of which has as many letters between them in the word (in both forward and backward directions) as they have between them in the English alphabetical series? Q13. In a certain code language, 'FASTER' is coded as 'ZUGHIV' and 'SUMMER' is coded as ‘FHNNIV’, then ‘LAVISH’ will be coded as '---'. Directions (14-15): Study the given information carefully and answer the given questions. Twenty persons are standing in a straight line, facing north. There are only three students between J and K. L is standing exactly between K and J. There are more than four students between J and M. M is standing sixth to the right of L. N is standing fourth from the right end of the line. J is standing sixth from the left end. Q14. How many people are standing between N and M? Q15. Which of the following will come in place of the question mark (?) in the following series based on the English alphabetical series?